I know. 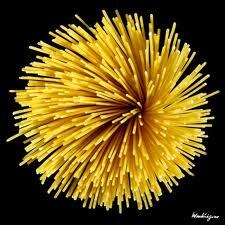 The carbs from spaghetti is not good for the body mass around my waist. Giving up on the variety of spaghetti and the ways they are prepared will be challenging. And the fact that pasta is the number one favourite food in the world will not help! But this is not why I am writing this blog. My imagination was stirred by an article in an issue of The New Scientist (October 18, 2011) on “the mathematics of pasta shapes” (Richard Webb). My initial thought: “what a sad life to be engrossed in reducing tasty pasta to some mathematical formulae”. Even sadder may be the case that I decided to read on and was pleasantly hooked on the idea. I do not know if George Legendre has a deal with pasta producers. Maybe not, but he has spent time and energy in compiling “the first comprehensive mathematical taxonomy of the stuff”. Now I starting to make sense from the reference of Birmingham’s spaghetti junction that commentators care to note when they want to put down the city! According to Legendre we should pay a closer look at what we eat. For closer scrutiny will reveal “three basic topological shapes in pasta – cylinders, spheres and ribbons.” But more than this, there is a logic and serious mathematics to its shapes. For when viewed in 3D the “curvaceous shapes of most pasta lend themselves to mathematical representations mainly through oscillating sine and cosine functions”. If only I knew this in secondary school: my love of pasta would have meant a greater interest into trigonometry for me! So every time we “dig” our blunt forks into that plate of pasta we need to be aware that “the sine and cosine of a single angle serves to define the coordinates of the points enclosing its unvarying cross-section, and a simple constant characterises its length.” We are not merely delving into or eating random shapes! There is beauty, logic and lots of mathematical equations here! There is more to the maths of pasta than the only kind we may be obsessed with, that is, adding on extra kilos! And some of the variety of shapes point to some real sophisticated and complex mathematics: even the plain looking penne “take some low modelling cunning, involving chopping the pasta into pieces, each represented by slightly different equations.” Legendre is so serious about the mathematics here that he has developed a collection of 92 shapes and their corresponding mathematical relationship. Ridiculous as this may read, he thinks that this proves that “immense variety and seeming complexity can be reduced to simple mathematical beginnings”. There is an equation and formula for everything! A thought worth considering…. And guess what, Legendre is using his pasta shapes and the equations to help architects construct buildings, bridges and other shapes etc. That plate of pasta shape will now be floating all around us as we climb them, walk on, besides and through them. So should we need to come off your pasta diet, we can just print the equation and savour it! I suppose that the author will be making enough on this to try another menu! In the meantime we may wish to suggest a volume on the mathematical shape of our favourite pasta sauce. And with the Italian economy in such a bad state this may be a good source of income! If only Silvio Berlusconi was not doing all of his thinking with “that thing” other than his brains: a good read of this book may have just been salvific for Italy and Europe! In the meantime, pasta lovers do delight in your pasta shape – even though you may eating a possible Nobel Prize for mathematics! What could be better for your digestion in a world gone wrong with managing economics and economies?